What does “success” in Early Psychosis Intervention (EPI) services mean to you? 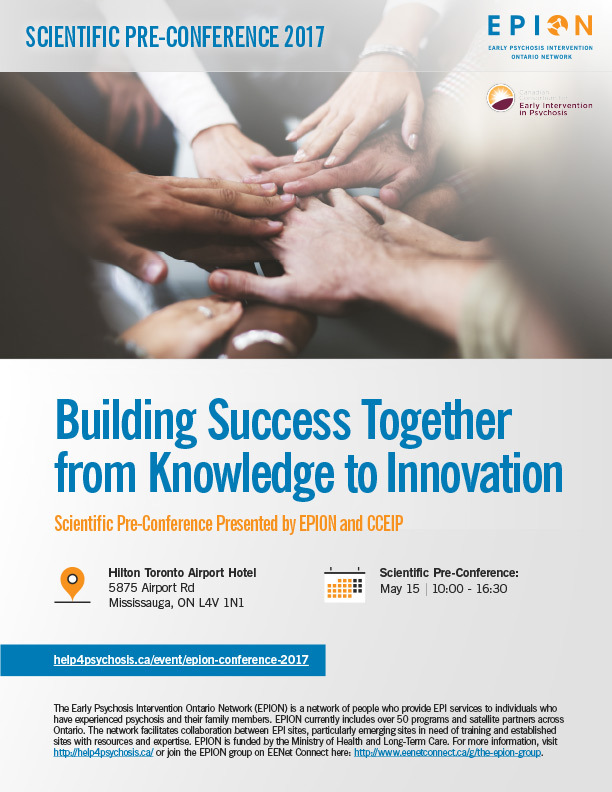 Join EPION for a two-day conference and explore different ways to define and understand success. 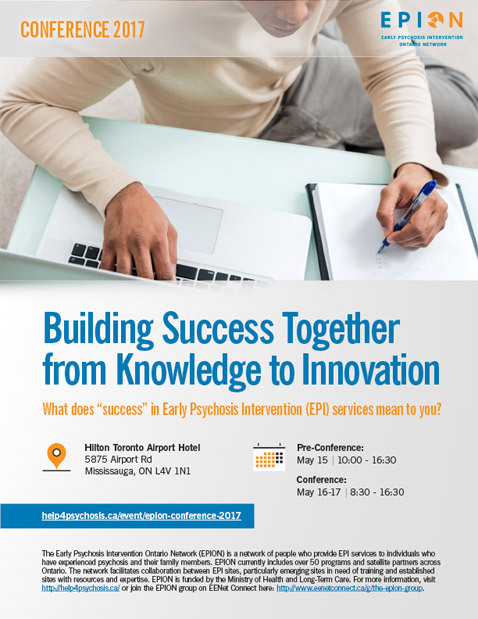 Connect with your colleagues to share and learn about innovations in EPI practice that help bring us closer to our visions of success as clinicians, psychologists, psychiatrists, program managers, persons with lived experience of psychosis and family members. Find out about the learnings and successes from programs that have implemented new practices, including those inspired by EPION’s recent think tanks on education and outreach, family work, metabolic monitoring, psychological therapies, knowledge exchange, evaluation and monitoring, and psychosis and cannabis. Understand the latest data and evidence on EPI and what it means for clinical practice and how we understand success in this field. Dr. George Foussias is an Assistant Professor in the Department of Psychiatry and Institute of Medical Science, Faculty of Medicine, University of Toronto. He is a Clinician-Scientist located at the Campbell Family Mental Health Research Institute and Schizophrenia Division at the Centre for Addiction and Mental Health (CAMH), where he leads the Virtual Reality and Behavioural Neuroscience Research Laboratory. Dr. Foussias’ research focuses on advancing our understanding and treatment of motivational deficits, and related negative symptoms, seen in severe mental illnesses. His approaches include longitudinal phenomenology and outcome studies, psychopharmacology treatment trials, neuroimaging, and the development of novel assessment methodologies using virtual reality, motion-tracking technology, and computerized assessments to tap into real-world performance and functioning. The ultimate goal of this work is to guide the development of more effective treatments for motivational deficits, which stand as an important barrier to functional recovery in severe mental illnesses. Dr. Jones is at the forefront of the development and implementation of robust participatory methods and research co-production involving persons with persisting mental health challenges/disabilities and their family members in the US. She received a PhD in community psychology from DePaul University. As a graduate student, she founded and directed the Lived Experience Research Network (LERN), an historic initiative aimed at bridging mental health advocacy and research in the United States. Dr. Jones served as research scientist and acting consulting psychologist for California’s Mental Health Services Oversight and Accountability Commission, overseeing the implementation of the State’s Prevention and Early Intervention Regulations. Dr. Jones research focuses on functional recovery and engagement within early intervention in psychosis services, transformative change in public mental health systems, and supported education. She is also an alumna of specialized early psychosis services and committed advocate for greater service user involvement and leadership in early intervention policy, research and practice. Dr. Tibbo is a Professor in the Department of Psychiatry with a cross-appointment in Psychology at Dalhousie University and an Adjunct Professor in Department of Psychiatry at the University of Alberta. He is also Director of the Nova Scotia Early Psychosis Program (NSEPP) and co-director of the Nova Scotia Psychosis Research Unit (NSPRU). In 2008, Dr. Tibbo was named the first Dr. Paul Janssen Chair in Psychotic Disorders at Dalhousie University in Halifax, Nova Scotia. In this position, Dr. Tibbo leads an internationally recognized program of research into the causes and treatments of psychotic disorders. Dr. Tibbo is a 2015 recipient of the Michael Smith Award from the Schizophrenia Society of Canada for research and leadership in schizophrenia. Dr. Philip Tibbo’s areas of research include application of in vivo brain neuroimaging techniques to study psychosis as well as research interests in co-morbidities in schizophrenia, psychosis genetics, addictions and psychosis, stigma and burden, pathways to care, education, and non-pharmacological treatment options.